^ Allen, James W.. Middle Egyptian : An Introduction to the Language and Culture of Hieroglyphs. Cambridge, UK: Cambridge University Press. ISBN 0-521-77483-7. ^ Ancient Egyptian Religion: An Interpretation by Henri Frankfort, p. 100. 2000 edition, first copyright 1948. Google Books preview retrieved January 19, 2008. Allen, James Paul. 2001. "Ba". In The Oxford Encyclopedia of Ancient Egypt, edited by Donald Bruce Redford. Vol. 1 of 3 vols. Oxford, New York, and Cairo: Oxford University Press and The American University in Cairo Press. 161–162. Allen, James P. 2000. "Middle Egyptian: An Introduction to the Language and Culture of Hieroglyphs", Cambridge University Press. Borghouts, Joris Frans. 1982. 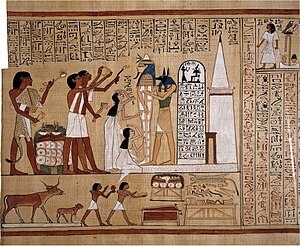 "Divine Intervention in Ancient Egypt and Its Manifestation (b3w)". In Gleanings from Deir el-Medîna, edited by Robert Johannes Demarée and Jacobus Johannes Janssen. Egyptologische Uitgaven 1. Leiden: Nederlands Instituut voor het Nabije Oosten. 1–70. Borioni, Giacomo C. 2005. "Der Ka aus religionswissenschaftlicher Sicht", Veröffentlichungen der Institute für Afrikanistik und Ägyptologie der Universität Wien. Burroughs, William S. 1987. "The Western Lands", Viking Press. (fiction). Friedman, Florence Margaret Dunn. 1981. 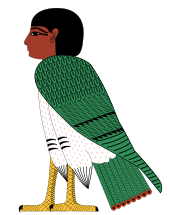 On the Meaning of Akh (3ḫ) in Egyptian Mortuary Texts. Doctoral dissertation; Waltham: Brandeis University, Department of Classical and Oriental Studies. ———. 2001. "Akh". In The Oxford Encyclopedia of Ancient Egypt, edited by Donald Bruce Redford. Vol. 1 of 3 vols. Oxford, New York, and Cairo: Oxford University Press and The American University in Cairo Press. 47–48. Jaynes, Julian. 1976. The Origin of Consciousness in the Breakdown of the Bicameral Mind, Princeton University.